Step off the beaten path and head to Dolphin & Whale Watching and National Museum of the Mighty Eighth Air Force. 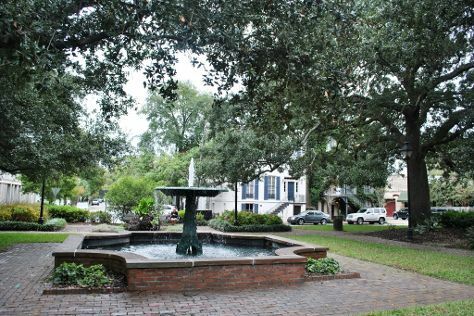 Savannah Historic District and Juliette Gordon Low's Birthplace will appeal to history buffs. There's still lots to do: steep yourself in history at Owens-Thomas House & Slave Quarters, see the interesting displays at American Prohibition Museum, get to know the fascinating history of City Market, and take in the exciting artwork at Liquid Sands Glass Gallery. For maps, photos, ratings, and more tourist information, go to the Savannah attractions planning app . Boston to Savannah is an approximately 5-hour flight. You can also drive; or take a train. In July, Savannah is a bit warmer than Boston - with highs of 91°F and lows of 74°F. Wrap up your sightseeing on the 21st (Sun) to allow time to drive to Saint Simons Island. St. On the 22nd (Mon), examine the collection at St. Simons Lighthouse Museum, contemplate in the serene atmosphere at Christ Church, then cast your line with a fishing tour, and finally steep yourself in history at Cassina Garden Club tabby cabins. To see other places to visit, more things to do, traveler tips, and more tourist information, read Saint Simons Island trip planner . You can drive from Savannah to Saint Simons Island in 2 hours. Another option is to take a bus. In July, daily temperatures in Saint Simons Island can reach 90°F, while at night they dip to 76°F. Finish your sightseeing early on the 22nd (Mon) to allow enough time to drive to Jekyll Island. Kick off your visit on the 23rd (Tue): identify plant and animal life at Georgia Sea Turtle Center, steep yourself in history at Horton House Ruins, and then tour the pleasant surroundings at Driftwood Beach. On your second day here, take a memorable tour with Tours, take in the architecture and atmosphere at Faith Chapel, and then wander the streets of Jekyll Island Historic District. For traveler tips, photos, other places to visit, and more tourist information, refer to the Jekyll Island itinerary planner. You can drive from Saint Simons Island to Jekyll Island in an hour. July in Jekyll Island sees daily highs of 90°F and lows of 76°F at night. Wrap up your sightseeing on the 24th (Wed) to allow time to travel back home.